Jill Barnattan is an impassioned integrative Clinical Herbalist. Jill believes in the healing qualities of plants, holistic nutrition, yoga, abhyasa (practice) and the innate power that each of us possesses to heal ourselves. Self care and cultivating self reliant healing tools is her top priority! Jill has experienced the power of both yoga and food as powerful medicine. Thus, the majority of her adult life has been guided by the exploration of many alternative healing practices, leading toward her own vital equilibrium. Jill understands that life is a journey with ups and downs and unwanted stress, leading to imbalance. Balancing never ends! Her intention is to empower her clients through coaching and education. Jill provides each individual with personalized herbal remedies & customized tools to assist the body and mind to synergistically work together. Medicinal herbs, nourishing foods, yoga therapy and beneficial lifestyle choices are all part of a comprehensive back to wellness regime. She works side by side with her clients, empowering each person on their journey toward holistic wellness. Jill’s work as an herbalist began in studying the soil, organic farming methods and plants. She has worked as an organic farmer, private chef and herbal consultant, educating many on the use of medicinal herbs, healing foods, skin care products & vitamin supplements. She is passionate about creating unique and simple skin & food products with herbs, especially those grown in her own garden. In 1996 Kaleidoscope Naturals was born. All products are made in small batches with love, reiki energy, healing affirmations and non GMO, organically grown, wildcrafted or pesticide free herbs & oils. We make NO MEDICINAL CLAIMS! All products are formulated with reference to traditional uses of herbs. ORGANIC HEMP & HERBAL HEALING SALVE is her first and most popular product. HOT STUFF, a cayenne based salve, hit the market in 2014 after being refined and field tested. Both signature salves continue to receive rave reviews! In 2009, Jill relocated from Maui to the pristine mountains of Mendocino, where she dedicated her time to advancing her knowledge of plants by wild harvesting, creating perennial herbal gardens and growing food that can be used as medicine. While in California, she has furthered her studies in the traditions of Traditional Chinese Medicine, Ayurveda and Western Herbalism. Some of her outstanding teachers include Lesley & Michael Tierra, Miles Coleman, Candis Cantin , Ken & Jessica Rose, Ben Zappin, Larken Bunce & Margi Flint. She continues to be inspired to learn & grow with her clients. Jill is a dedicated Yoga student for over 20 years, always striving to dig deeper into her practice, concentrate on structural alignment and discover the poses that will assist her and others with common ailments and inner peace. She has gratefully studied under many disciples of BKS Iyengar and Patabi Jois including Nicki Doane, Eddie Modestini, Kay Huckabee, Kathleen Flanagan, HS Arun, Leigh Milne and Paul & Suzi Grilley. 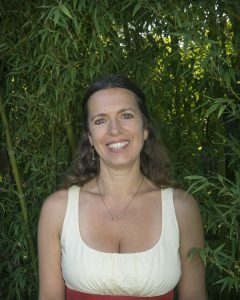 Jill holds a certificate as a Certified Professional Planetary Herbalist from Lesley & Michael Tierra’s East West School of Planetary Herbology, is a certified Yoga instructor (RYT 200) & Reiki practitioner. She is currently pursuing a Flower Essence Practitioner Certification from Flower Essence Services. Herbal healing can be met using many approaches. Experience the magic of herbs today! Choose one or all of the following options. 2. Purchase original herbal products produced by Kaleidoscope Naturals and Vital Equilibrium’s hand crafted apothecary.